At Kauai Backcountry Adventures, you can “get high” on exhilarating Kauai Zipline Adventures! Descend a mountain side as you fly across seven zip lines. Zip line Tours in Kauai provide the thrill of soaring and flying like a bird over a pristine rain forest! Feel the rush as you glide over lush tropical forests and deep valleys. 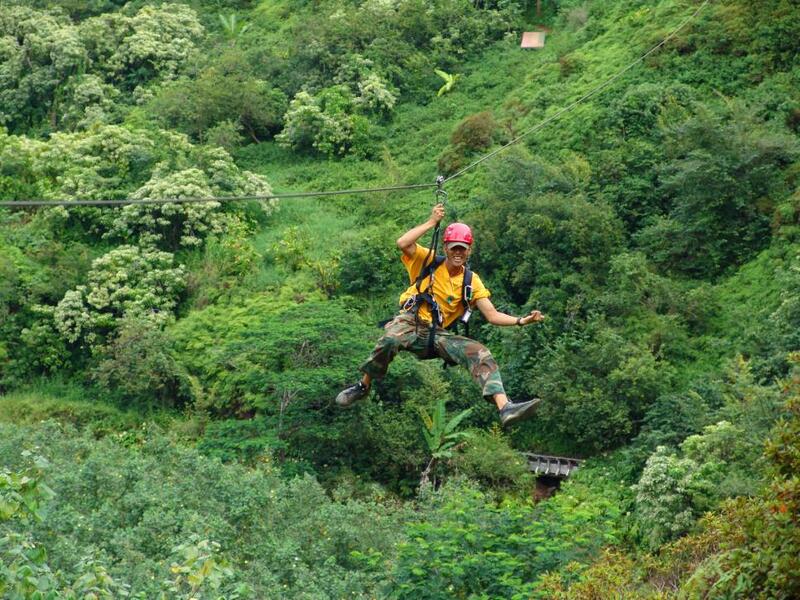 Kauai Backcountry Adventures Zipline Tour has exclusive access to over 17,000 acres of former plantation land. This Kauai Zipline Tour can offer you a truly one-of-a-kind experience. Your Kauai Zipline Tour will begin with a fun and informative scenic ride in our four wheel drive adventure vehicle as your certified guide will share interesting information on island culture, history, flora and fauna. At the first zipline, you will receive a thorough briefing, preparing you to soar over streams, tropical forests, and jungles rich with spectacular scenery! You will zoom down the mountainside, sailing along on a series of seven ziplines, as you make your way to the valley floor below. Relax, bask in the sun, or soak in our natural swimming pool. Zipline Tours in Kauai are an incredible experience which will leave you with vacation memories of a lifetime. Kauai Backcountry provides Helmets, Harnesses, Lunch and amazing Zip Line Tours in Hawaii. Participants must be 12 years or older and weigh between 100-250 pounds. Participants must have good knees, hips and back. Participants must wear covered and secured shoes. All guests must be able to speak and understand the English language for safety purposes. What to Wear/Bring on Kauai Zipline Adventures: • Long Pants or knee length shorts, Covered and Secured Shoes such as tennis shoes or hiking boots, Wear a swimsuit under your clothes, Bring a towel, sunscreen and bug repellent, Hair ties to secure long hair.